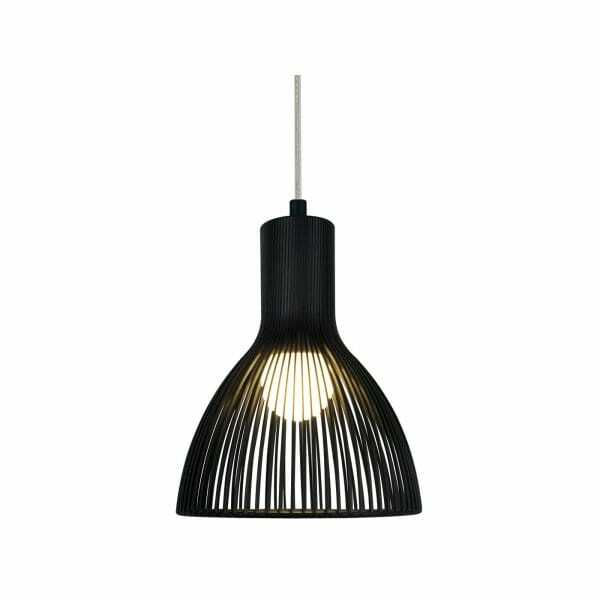 Define black metal ceiling pendant light with a long drop ideal for lighting high ceilings. This is the larger of the two ceiling lights in this range and it is a double insulated ceiling light designed by Scandinavian designer Carlo Volf. Great for using in kitchens or over tables and can be used individually or in groups. How about hanging a group of 3 together at the same height over a longer dining table or try grouping a cluster of 3 hung at different heights over a kitchen island. The light is fixed to the ceiling on a small circular black metal rose and suspended on a long thin wire. With a drop of over 3 metres, this is a great pendant light for high ceilings. It will work on sloping and vaulted ceilings. The wire can be shortened when fitting to adjust the height. The shade itself is in black metal with thin bars formed into the pear shaped metal cage. The fitting is double insulated and can be used with either standard or low energy bulbs. Works really well with the large decorative low energy bulbs.